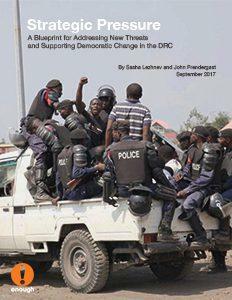 Today, the Enough Project published “Strategic Pressure: A Blueprint for Addressing New Threats and Supporting Democratic Change in the DRC,” by Founding Director John Prendergast and Deputy Policy Director Sasha Lezhnev. The report recommends that an effective strategy to bring Congo back from the brink of crisis should focus on strongly supporting Congolese efforts to achieve a democratic transition through a much more robust strategy of financial pressure. At the same time, the strategy should entail pushing for key structural reforms and immediate conflict mitigation steps in the Kasai region and the east. Prendergast and Lezhnev argue that it is not yet in the Congolese regime’s financial interest to pursue a democratic transition given the immense profits reaped by the Kabila family and its commercial partners despite the economic crisis, Kabila’s control over the security services, and the opposition’s current weakness. Significantly increased financial, diplomatic, and other pressure on the regime and its partners are needed first. The Kabila regime relies on the U.S. dollar, euro, and international financial system to launder the proceeds of corruption, creating major leverage for the United States and Europe.